Journal of Workplace Learning, Vol. 17, Iss. 1/2, pp. 130-136. Companies endorsing the importance of knowledge innovation cannot get around the corporate university concept as part of their strategy. 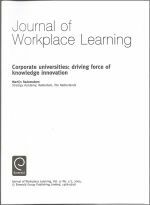 In this article three major corporate university types are identified, and linked to their strategic role as the driving force of knowledge creation.